Experience the feeling of waking up each morning feeling energized and excited to attack the day with this 5-week (35-day) Nutrition, Fitness, and Lifestyle challenge. 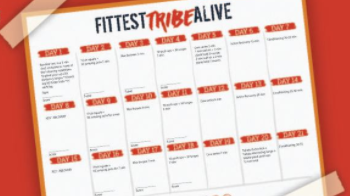 Join the Fittest Tribe Alive from anywhere in the world and be held to EXTREME ACCOUNTABILITY as you learn how to maximize your time efficiently and create lifelong, healthy habits that will allow you to live with more purpose by developing yourself into the person you need to be to create the most extraordinary, fulfilling and abundant life you can imagine. Join Master Lifestyle Coach Luke Kayyem on a 35-day EXPERIENCE and EDUCATION on living a higher quality of life. Through EXTREME ACCOUNTABILITY and World Class Coaching, you will not only have a better understanding of how to transform yourself into the greatest version of yourself but understand exactly how to do it. You will be challenged to do more with each moment of every day by creating healthy habits and morning rituals that will empower you to live with more passion, purpose, and positivity. You must be strong and make sure you spend less time with the people and that don't encourage and challenge you to become the best you can be. In just 35 days you will see a massive shift in the way you look, feel and act every day.